Standard - $29.99 Only 3 left! Have you ever changed your name? Maybe, your parents named you Kevin. Maybe you didn’t like that name. You much preferred Lando. You couldn't legally change it at 12 years old. But, you demanded that your parents, friends, and neighbors stopped calling you Kevin. Insisting that your real name was Lando. We get it. We asked our parents to call us Han for a year, then we saw Die Hard and met Hans Grueber. What planets are the coolest to visit? Well of course anywhere but Hoth. Unless you are really into skiing, and tauntaun intestines. Oh, and maybe not Dagobah. The nasty swamp smell might not be worth the possibility of spotting an ancient Yoda. Coruscant, the largest city we've ever seen. Probably, because it is an entire planet. Naboo, with it's beautiful architecture, and wonderful lakes, would be wonderful anytime of year. As a member of the ship Ghost, you can use the fact that you no longer use your real name. And get to visit all the planets in a galaxy far, far away. 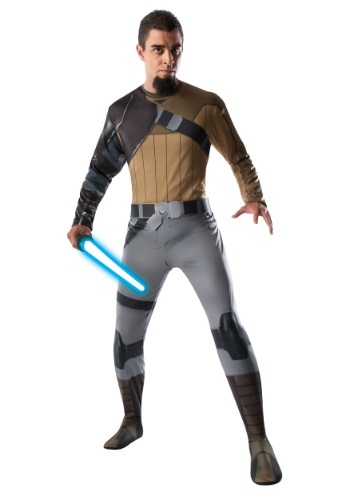 By dressing in this Star Wars Adult Kanan Rebels Costume, you can do all the exploring you want. Just, don't be surprised if someone called the Inquisitor comes looking for you. Or, if you get stuck with your very own padawan. But, you will look awesome in Kanan's signature look. Besides, you get a lightsaber, and a blaster gun. We're jealous, also it might be best if you avoided Dagobah, we weren't kidding about the smell.